When a person dies, apart from assets and liabilities, there are other things too that get transferred to legal heirs. 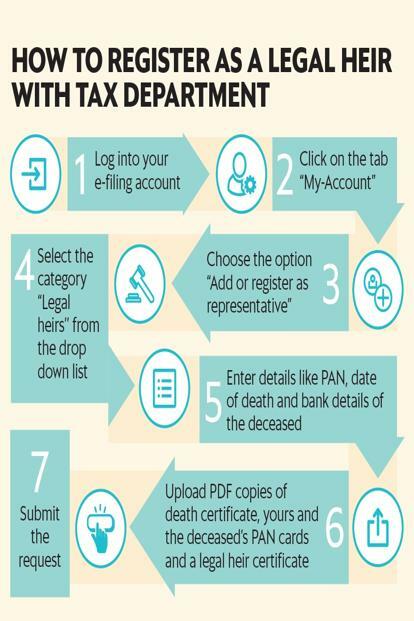 These include the responsibility to file the last income tax return on behalf of the deceased and surrendering the person’s documents like permanent account number (PAN) and Aadhaar. Here is how you should go about it. “As per section 159 of the Income Tax Act, 1961 in case a person dies, his/her legal representative shall pay the tax due, just as the deceased person would have, had he/she been alive,” said Archit Gupta, CEO and founder, ClearTax. If you are a legal heir, you need to register yourself as a representative of the deceased person with the tax department. The “request is sent to the e-filing administrator. Once the request for registration as legal heir is approved, you can file returns as legal heir on behalf of the deceased,” said Gupta. Not filing returns can land you in trouble. “The proceedings under income tax law for non-payment of dues, shall apply to the legal heir. Though the law says the dues recovered from the legal heir shall not exceed what has been inherited by her,” said Gupta. To surrender the deceased person’s PAN card, you need to write an application to the assessing officer (AO) under whose jurisdiction PAN is registered . The letter should contain reasons for surrender (i.e. death of the holder), name, PAN, date of birth of deceased, along with a copy of death certificate. As of now, UIDAI hasn’t put in place a procedure for surrender after death. But as a security measure, you should get the biometrics locked. Once locked, the same cannot be used by anyone for authentication or transaction. However, this facility can only be accessed online and you need to generate a security code through the registered mobile number of the deceased. To do this, you have to go to the Aadhaar services tab on UIDAI’s homepage, and click on the “lock/unlock biometrics” link. This will take you to the page: resident.uidai.gov.in/biometric-lock. Follow the instructions, thereafter. ← Redemption of Debentures of Kotak Mahindra Prime Limited.